This month on Instagram I have been doing a Buildings of Brisbane theme so I thought that this week it would appropriate to share a photo of my favourite building in Brisbane. When: 30th September, 2007… That’s a wee while ago now! Being Arty: I love this building but this view doesn’t even show the reason why I love Customs House. I was being arty one day, well trying to be arty, and had walked around the building taking photos from all different angles but I really loved this one. I was just starting out with the idea that I might like photography so was trying all kinds of different techniques – not just with taking photos but with editing process as well. A Wee Bit of History: Built in the late 19th Century when every major port in Australia had a Customs House, the building is in the style of Victorian Free Classical – no idea what that really means but I am guessing in the classic style, I mean, it has columns. The building continued to operate for around 100 years until the wharves in central Brisbane were demolished and moved closer to the mouth of the river – which is a lot further out of the central city. In 1988 the offices in the building were closed and the 300 or so staff left the iconic building. It was pretty much abandoned after this time. A Wee Bit More History: The University of Queensland (not my uni) took on a lease of the building and embarked on extensive restoration project to restore Customs House back to her former glory – 100 years of office workers had left their mark. 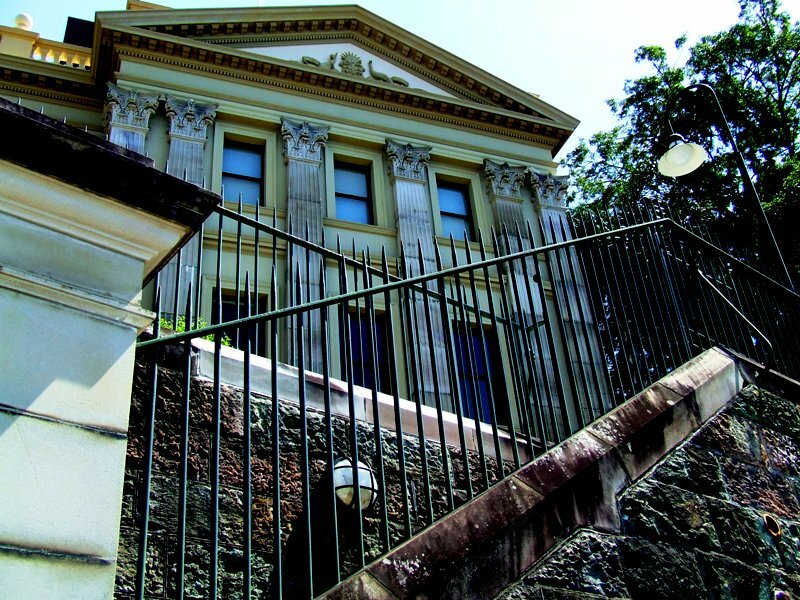 In 1994 Customs House was reopened and has been used for various UQ functions over the years. It is also available for hire and I have been lucky enough to attend a few functions myself over the years. The main function room is a beauty to behold with her high domed ceiling and gorgeous star-like light. Visiting: You can visit Customs House however areas open to the public are limited but the best time to visit is during the annual Brisbane Open House where they have tours available, that I highly recommend. Or you could simply head to the Customs House Restaurant, which is situated on the river side of the building and has spectacular views of the Story Bridge and Brisbane River. Favouritism: Sometimes I feel like I have a lot of ‘favourites’, especially when it comes to architecture. I am always saying things like “this is one of my favourite places” but I can say without conviction that Customs House is my favourite building.. in Brisbane. I have lived in this city for nearly 15 years and have a few favourites around the place – like Parliament House, Old Parliament House and even the more modern One One One Eagle Street. But for me, it always comes back to this building. I love the classic design and clean lines but I think I have a thing for domes. Funnily enough – or weirdly, most of my absolute favourites seem to have domes on them.